Because both Dr. Barrow and Dr. Wiley are active in showing their own horses, they understand how important it is to address and fine-tune the mechanics of soundness. BVS offers comprehensive lameness exams and can provide the latest technology in diagnostics and treatment. Dr. Barrow has had a special interest in this area, and is always on the cutting edge of what's new in soundness and sports medicine therapies. We offer a variety of options for a wide range of equine athletes (or retired companions who just need to stay comfortable), ranging from corrective or therapeutic farriery to regenerative medicine to acupuncture, or any combination of these. Amazing imaging equipment now allows us to see more detail inside the Equine limb than ever before, and we truly enjoy being able to keep horses sound and comfortable while allowing them and their riders to reach new personal bests. Digital Radiography can be especially useful with Podiatry assessments. 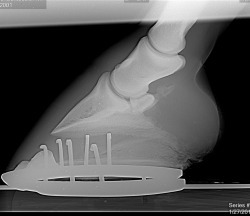 Below is an example of a front foot before and after corrective shoeing on the same day. Note how the corrective shoeing changes the weight bearing angle of the bony column. The shoe was placed back farther on the foot and a wedge-type shoe was applied. This decreases the amount of stress on the tendons and ligaments along the back of the pastern and foot and also eases breakover.